Pan Am Historical Foundation, had hosted a series of events commemorating the greatest milestone in air transport history. 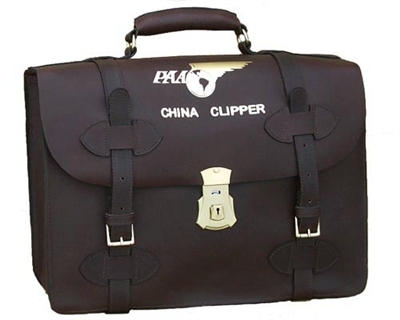 November 2010 marked the 75th anniversary of the famous China Clipper flight which opened the Pacific to the world's first regular transoceanic commercial air service. Custom Hide, working directly with the San Francisco Aeronautical Society, reproduced the original briefcase issued to the crew of the China Clipper. WAKE ISLAND, Nov. 26.—(Via Pan-American Airways Radio.) —(AP) —Air mail sped across another stretch of the vast Pacific Ocean when the China Clipper landed here today (Tuesday) en route to Manila after a swift 1,191-mile flight from Midway islands. The mighty seaplane glided to a landing at 1:40 p.m. (6:40 p.m. Monday, Pacific Standard Time), taking eight hours and 28 minutes for the flight, an average of about 125 miles per hour. The voyage across this shortest link in the California-Manila route was accomplished in much faster time than Capt. E.C. Musick, skipper of the 25-ton craft, had anticipated. 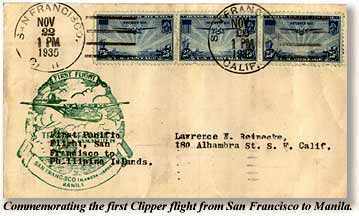 In about 38 and one-half hours of flying, the China Clipper has crossed nearly 5,200 miles of the 8,000-mile distance between Alameda, Calif., and Manila, end of the present journey to establish transpacific air mail service. Mail and supplies for the Wake Airways Station arrived aboard the seaplane which also brought nine employes, who will be stationed here. En route here, the plane dipped low over the steamship President Lincoln, which saluted with three whistle blasts. The China Clipper left Alameda Friday afternoon [Nov. 22, 1935], and has stopped overnight at Honolulu and Midway. On today’s flight, the international dateline was crossed, and time aboard the four-motored craft jumped ahead one whole day. Ahead of the plane lies a 1,500-mile flight to Guam, last of the island way stations, and then a flight of 1,700 miles into Manila. Present schedules call for the voyage to Guam tomorrow, with Manila being reached Thursday. 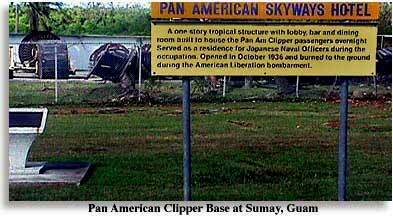 WAKE ISLAND, Nov. 26.—(Tuesday)—For four years I flew over the Spanish Main in Pan American clippers, but I never enjoyed a flight so much, or go so great a kick out of one, as I did from this breakfast-to-lunch dash from Midway to Wake Island. The astonishingly smooth and reliable performance of this 25-ton air juggernaut, and the precision of the 55 dials and the 42 gadgets that face me as I sit on duty during the flight just under the 130-foot wing, are never ending delights to me. Our veteran skippers and crew men, and the complete facilities of our bases strung across this big ocean make a flight like this seem as safe as a train to a suburb—as it is. I am finishing this just before going ashsore. We have landed at Wake, 8 hours and 28 minutes out of Midway. At 10:30 a.m. (our time), four hours and a quarter after our takeoff from Midway, we pass the halfway mark on this long voyage to Manila. Picking up our first tail wind of the day only a short time before, we are clicking along at 160 miles per hour. We got up with the gooney birds this morning at a quarter to four, Midway time, and had our breakfast all tucked away before daylight. The lagoon was calm in the tropic dawn as Captain Musick gave our 3,200 horses their heads, and the goonies flapped up with shrill screams at their roar. As we cleared the lagoon and swung into a wide circle by way of salute to our comrades left behind, we headed into the head winds of a “cold front” an area where cold air currents are running in the sun kissed winds of the South Seas. Off to the south we could see heavy rain squalls darkening the ocean’s surface, but where we were the sun was shining. Almost before we notice it it is tomorrow. We don’t feel any older, but our instruments show us we have flashed over the international date line, out of Monday into Tuesday. It’s a funny idea. What is this time anyway? The same sun is shining that glinted off our wings as we lifted from the lagoon at Midway, but it’s Tuesday’s sun now when it was Monday’s then.